It’s not uncommon for diners at nearby tables in restaurants, or new arrivals on the way to their seats, to appraise your selection as the waiter places it before you. But it’s quite something else to have your perfectly cooked fish surveyed by its own brethren from the flood-lit waters encompassing your intimate perch on the bed of a lagoon. This is 5.8 Undersea Restaurant, the signature eatery of Hurawalhi, the latest luxury retreat in the Maldives, and the dining experience is as captivating as the vibrant congregation ducking and weaving beyond the glass. As the name suggests, we’re dining nearly six metres under the shimmering surface of Lhaviyani Atoll’s pristine lagoon, a 40-minute flight in the resort’s own seaplane from the archipelago’s international airport on the main island of Malé. While underwater dining is not a new experience in the Maldives—a destination that counts a brunch hot spot, a jazz club and even a spa among its underwater venues—5.8 trumps them with the imaginative cuisine of shy German chef de cuisine Bjoern van den Oever, a veteran of Michelin-starred kitchens. His degustation menu, packed with flavour and innovation and paired with excellent wines, is served to no more than 10 couples per sitting in the intimate setting. It’s all very sophisticated, but that’s what you’d expect from an unapologetically adults-only, all-inclusive retreat. With its world-class dining and crisp, intelligent service, Hurawalhi sets itself apart from many of the sun-kissed settings of the sprawling Indian Ocean nation. But most important is the resort’s ability to keep other people’s little darlings out of the picture. The barring of children under 15 leaves beaches free of sand castles, mealtimes undisturbed by temper tantrums, and long, lazy mornings uninterrupted by ear-piercing squeals to savour. You’d be forgiven for rarely venturing from your villa. 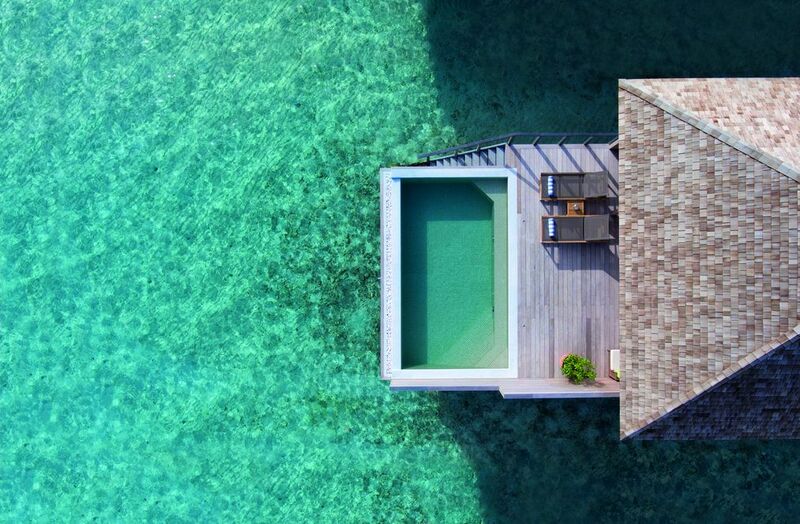 Hurawalhi has 90 of them—the Beach Villas nestled on white sand and shrouded by lush foliage, the Ocean Villas perched above a reef that meanders through the lagoon. Some have private plunge pools, but that’s the only difference. All are bright, spacious and airy, with splashes of bold colours calmed by polished timber floors. The bathrooms, big enough for tae-bo sessions, open onto a sweeping sundeck with versatile shading. There’s high-speed internet, 48-inch flat screen televisions, heavenly king-sized beds facing the ocean, minibars and wine fridges packed with all-inclusive goodies, and diligent villa attendants to ensure niggle-free hibernation. When you feel like being active, there’s plenty outside of the villas to keep you occupied: a tennis court, games room, a water sports centre with Hobie Cats, wakeboards and jet skis, a resident marine biologist, and an outpost of Pro Dive offering courses and experiences for those who like to explore below the waves. Early one morning I head out with Dutch dive master, Morton. At Hurawalhi—unlike at some of the Maldives’ big-name resorts, built on man-made islands a long boat ride from decent coral gardens—you simply step off the end of one of the resort’s two piers to immerse yourself in the captivating colours of the vibrant house reef. We trace our way along mesmerising coral walls that are home to blennies, coral hawkfish, hawksbill sea turtles, blacktip reef sharks and squadrons of eagle rays. If you time your visit right, you can also see manta rays just metres from the resort. Later that afternoon, we join a clutch of the resort’s rather gorgeous guests and take to the house reef again for a guided snorkelling excursion that's included with our packages. Within waiter-hailing distance of the main bar, we’re joined by curious Moorish idols, Napoleon wrasse and elegant eagle rays, which show off in the shallows before diving deep. It’s a great way to build up an appetite to sate at any of the resort’s culinary destinations—where there isn’t a bib, high chair or kids menu in sight. Above Van den Oever’s temple of underwater dining is the Aquarium Restaurant, which serves a contemporary menu of delectable Asian-inspired bites laced with organic ingredients. Its intimate teppanyaki bar is popular with couples soaking up the night air. At the other end of the resort, the Champagne Pavilion is the perfect spot for enjoying breathtaking sunsets with a selection from the romantic bar’s extensive list of vintage champagnes (it’s also the best location for dolphin spotting). But the heart of this toddler-free utopia is Coco Bar, which is adjacent to the resort’s infinity pool. Here, sharing-style snacks and tiki-esque cocktails are served to the nightly accompaniment of live music and DJs. See also: Are Instagram Butlers The Next Big Travel Trend? Just steps away, a multinational culinary team led by dynamic young Kiwi executive chef Shannon Batten cooks up a storm at the live stations of the stunning Canneli Restaurant, a shrine to great global cuisine. Hurawalhi’s blissful isolation seems to have little impact on the freshness and diversity of ingredients. One night we’re feasting on Maldivian and southern Indian curries, the next we’re whisked away to Italy, complete with caviar-topped pasta dishes, jet-fresh oysters and lobster. To make the most of your escape, be sure to book a candlelit dinner on Dream Island, a picturesque sandbank peeking above the water, and make a beeline for Duniye Spa, an intimate, elegant wellness enclave that boasts an extensive menu of Asian-inspired treatments using Healing Earth organic products.